Contact us for a free research quote showing how many high quality articles we have for you. Then YOU decide your preferred number of articles, and THAT determines your price. Each book is 100% custom made for you. We have access to your press clips, but you can send us clips you have saved too. Can go back in time – any season, including college and high school. Not limited to press clips and photos. 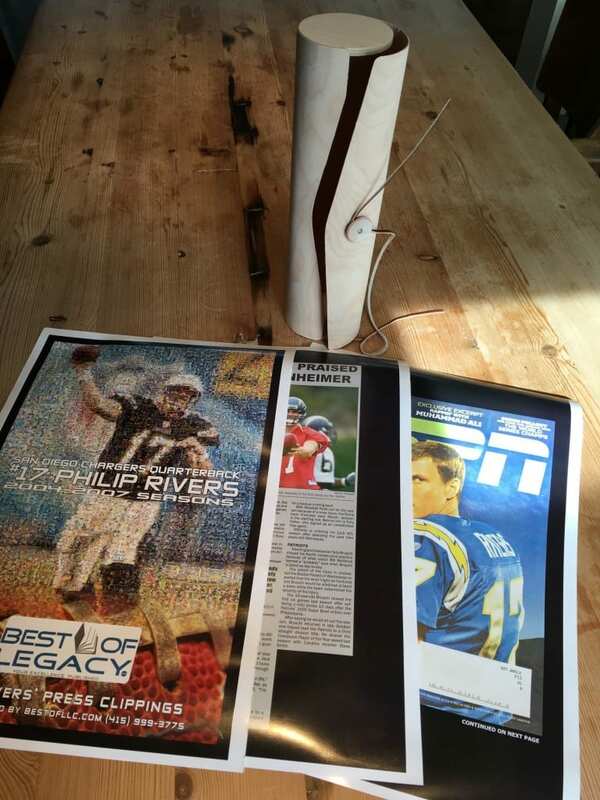 Send us any printed material like; sports cards, programs, awards, print ads, letters, email, etc. We'll scan your items and return them to you. Materials: Our books are made of fine Italian leather and they come inside an artistically designed custom slipcase for protection. That package is housed in a drawstring cloth bag and it’s all delivered in a handsome wooden display case. Delivery time: 6 weeks + shipping time for most orders (rush orders may be available for a fee). We also have a beloved solution for last minute shoppers called a “Preview Tube,” seen below. It’s a few actual preview pages from your book, including the mosaic inside cover page and a photo of what the final book looks like. It’s all delivered inside a designer wooden cylinder, giving the recipient something to unwrap. A great preview of their book. Books cost $1650 for 50 articles and the price increases with additional articles. Photos provided by us are free and typically we use lots of them! Contact us for a quick free research quote, then YOU decide how many articles we use, based upon the price you’d like to pay. A video highlights screen is an option for any book for $450 extra. The IRS views our service as ‘resume’ material, so it’s a tax write-off for anyone with their own foundation or business. You can download this Tax Deduction Letter for your accountant. Extra copies of any book are available at-cost, $600 apiece. That covers the cost of printing, binding, embossing, packing and shipping. They can be ordered now or at any time in the future. We accept these payment methods, in order of preference: Venmo, debit card, check read over the phone, wire, check mailed to us, credit card, Paypal. Preserve your legacy for future generations. Ultimate gift for the person who has everything. Perfect calling card for life after sports. Help market yourself -- advertisers and coaching positions. If there’s a problem with your book, we’ll fix it. If we can’t fix it, we’ll refund your money. We take this guarantee very seriously, so we encourage you to read this entire page and observe our website photos/videos to ensure you know what you’re getting prior to ordering. We can create a book using Spanish Language media. Please inquire.